Pressure tank in place with cradle and tie down. 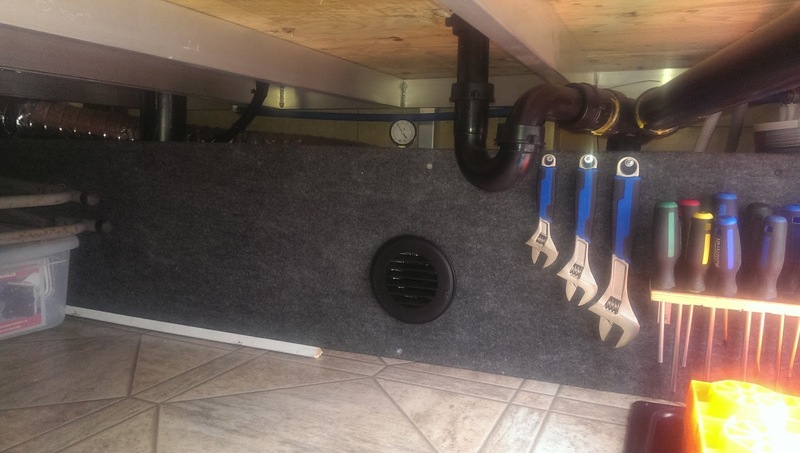 I decided to install a small pressure tank in our 5th wheel trailer. The benefit of having a pressure tank is that the pump does not always kick in and out as often, resulting in less noise. Also for us we do a lot of dry camping and we can have access to lots of water with out running the pump in the evenings and when using the washroom at night. Saves battery power when the solar panels are not working. Pressure gauge and valve in place. First I decided on a place to put the tank where it is easy enough tie in to the current water line. The tie in should be on the pressure side of the pump. For us it worked best in an area that was blocked off and not used at all in the pass-through compartment or what I call the "underbelly". This area is within 2-3 ft of the water pump. Since there was no pressure gauge anywhere in the RV showing the water pressure, I decided that this would be a good time to add one. A valve also seemed to be in order so I could by pass the pressure tank if need to be. After measuring and figuring out what pluming parts were needed I headed off to the local plumbing shop. I even brought along the hose on the pressure side of the pump that goes from the pump to the filter (this is where I decided to tie in the pressure tank). I purchased a 4.8 gallon tank, pressure gauge, a valve, all the fittings and a 3 ft chunk of hose. 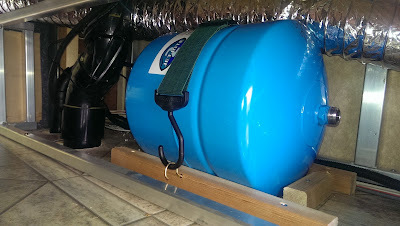 These kind of pressure tanks can be installed laying down and that worked best for me. I made a little cradle so the tank can not move around and added a couple of hooks for the tie-down. Added all the fittings with lots of Teflon tape. 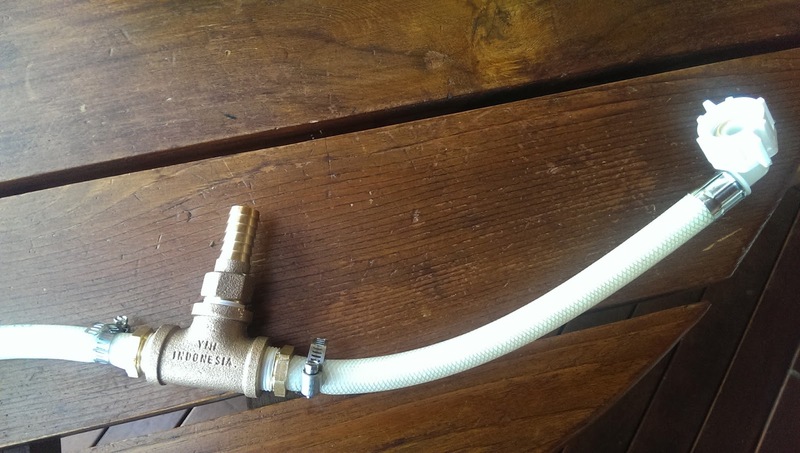 When it came to tying in to the existing water line and adding the extra piece of hose, I put the hoses in some hot water for a few minutes, they are then much easier to work with. Everything hooked up and tightened up it was time to turn the water on. Must have done something right, no leaks. Panel installed back in to place. All that is showing is the pressure gauge. The pump cycled and the pressure came up to 40 psi. This was perfect for me since the pressure tank comes pre-charged to 38 psi. 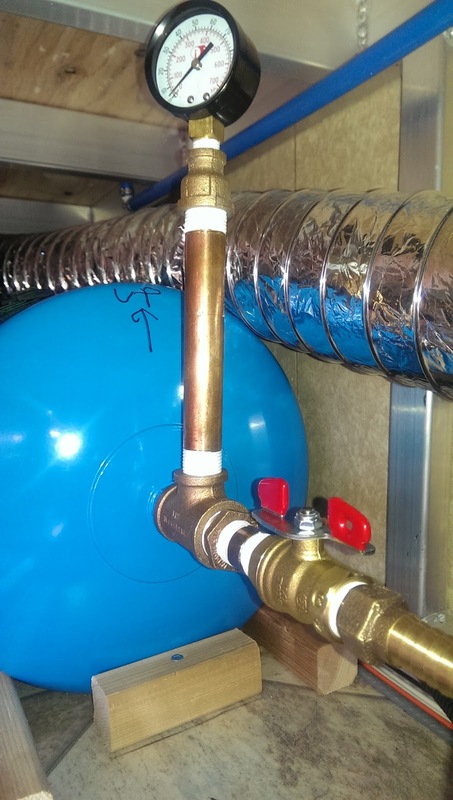 When installing a pressure tank like this the charge in the tank should be 2 psi below where the pump cuts in (according to manufacture recommendation). In my case 40 psi. If you have to change the pre-charge in the tank, make sure to have no water pressure on the other side. The air valve stem is on the top or opposite side of the water intake. Use your compressor to add more air or press the valve to release air. Just like on a tire. It all seems to works well. Will keep you posted if I have to change anything. Thanks for posting, I wasn't actually sure you could install a pressure tank, I have been thinking about doing that with my off grid cabin. I will have to think about how to install it so it makes it easy to drain or disconnect from the system in the winter when I run antifreeze through the lines.